Help is at hand in the run up to Ramadan for Muslims to receive support in quitting tobacco before the holy month begins in May 2019 this year. Ramadan is one of the most important events of the Islamic calendar as it is a time for fasting, praying, forgiveness and purification. It is seen as a time to start positive habits, making it an ideal time to stop tobacco. 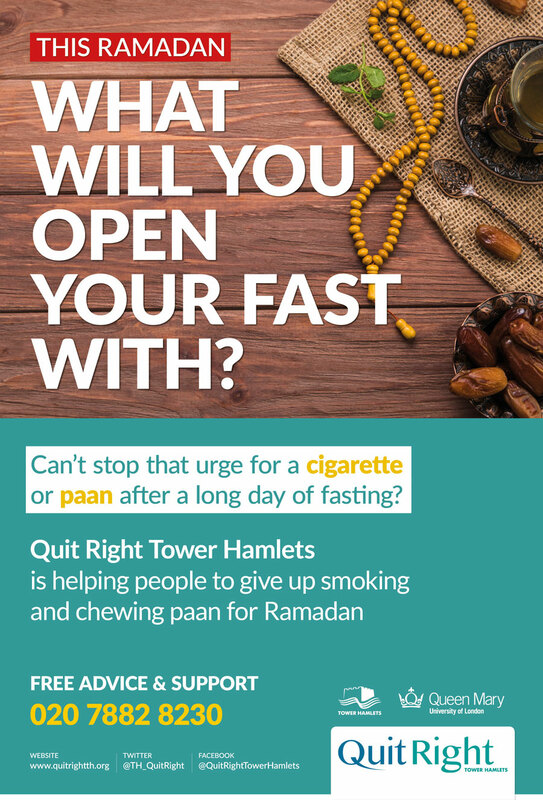 Our Ramadan campaign is launching on Friday 5th April 2019 to sign residents up to stop smoking or chewing to prevent nicotine cravings during the fast. Smokeless tobacco (chewing tobacco like ‘sada’ and ‘zarda’) is widely used in the South Asian community with Betel nut and paan leaf. Tower Hamlets has one of the highest rates of smokeless tobacco use as well as other products like shisha. Although Tower Hamlets has some of the highest levels of smoking and smokeless tobacco use in London, smoking rates continue to decline. Last year, the council and its partners across health services helped over 1,350 people quit smoking in Tower Hamlets. Quit Right Tower Hamlets will be offering free and friendly advice on stopping smoking or chewing tobacco at the following locations. Alternatively you can also find your nearest session on the interactive map. If you have a long term condition (i,e diabetes, high blood pressure heart condition) and are taking medication please talk to your local pharmacist, practice nurse or GP who will be able to advise you on your medication during Ramadan. You can drop in to your pharmacist or GP for advice and support on stopping smoking at any time. To speak to a health advisor of Quit Right Tower Hamlets in English or Bengali, call 020 7882 8230. See the council’s page for information on stop smoking services.